I’ve read a few articles recently about how to get a new generation of woodworkers started, and the concern that our craft may not have the same longevity now that it had in the past. These days it seems like woodworking classes in schools are few and far between, price of entry to woodworking can be prohibitive, and frankly, there is less interest in woodworking nowadays for kids who have highly-stimulating video games they could be playing instead. And yet, there are some ways that we can reverse this trend, and not only introduce kids to a new craft that could stay with them for the rest of their lives, but also create a good opportunity to learn and build something together. 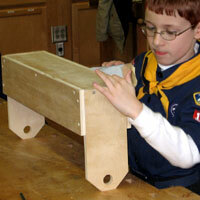 Highland Woodworking now has a Woodworking Toolkit for Kids, a great introductory tool kit. 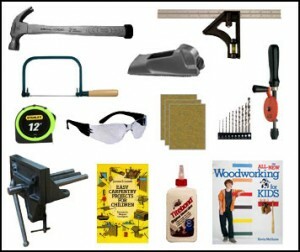 It has all the tools you will need to help the child in your life start woodworking, including a pair of safety glasses, a portable workbench vise that can be mounted on almost any table, a coping saw, a hand drill and drill bits, a pocket plane, a combination square, a small hammer, a bottle of wood glue, an assortment of sandpapers and rubberbands, and two instructional project books written specifically for kids. 1. Get them hooked early – the tools in this kit are appropriate for ages 7 and up. 2. Share this experience with them – these tools are strong enough for grown-ups to use too! But make sure you are letting the kids do the work so they feel their own sense of accomplishment. 3. Build something that they can see and show off every day. This sort of reinforcement will have them coming back to build more projects before you know it. The tools in this kit are not the cheap plastic versions you often see in toolkits for kids. Instead these are quality tools that will last, and hold up well, even for a child who really takes a shine to the tools and uses them regularly. The books included in the kit will help to provide ideas for items to build as well as giving some instruction on how to use the tools. The kit retails for $99, and although this isn’t an inexpensive gift, if you compare it to the cost of many other items that the child in your life has included on their gift list, it is much less than a video game system or a pony, and will most likely provide many more opportunities for you to enjoy the present together. So if you are having trouble finding a good gift for the kids in your life this holiday season, look no further. The Woodworking Toolkit for Kids might be just the thing you are looking for! This is exactly the kind of “out of the box” (or “in the toolbox”) thinking that our hobby/craft needs! Great job Highland! Fundamentals of Woodworking with Sabiha Mujtaba, Day 2: Officially a Beginner Woodworker The Plane Facts: Bench Planes – why are there so many sizes?